Maus: A Survivor’s Tale is an unencumbered narrative produced by Art Spiegelman about his father’s experience as a jew in Nazi Germany. I had never heard of Maus before last Wednesday but, since then, I have done what any burgeoning academic does nowadays: Google it. The first takes place in Rego Park, New York circa 1978-79. Spiegelman (the latter) interviews his father, Vladek. The second takes place in Nazi Germany, beginning with the rise of the Nazi party and the segregation of jews into the Sosnowiec Ghetto where we follow Vladek as he narrowly avoids encounters with the Gestapo and runs, tail between his legs, from bunker to bunker. The narrative is engrossing alone, but Spiegelman’s work is best known for its representation of the human condition in the forms of mice, cats, pigs, and a varying assortment of other critters (depending on which page you’re on). 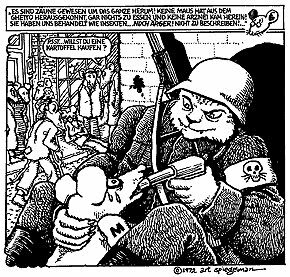 The mice consistently represent the repressed population of Germany (circa 1943 onwards) while the much larger and meaner cats represent the historically oppressive and totalitarian extensions of the nazi party. The pigs? They’re our friendly neighborhood Poles. Spiegelman’s use of these three specific animals is hardly arbitrary. Rather, in Spiegelman’s depictions of these three groups of people, we may begin to associate certain characteristics of each animal with the human counterpart they represent. As humans, we tend to associate mice as characteristically weak, timid, and fear. Cats (and humans) may feel superior to them in size and in volume. Mice easily go by unnoticed, scurrying from one dark hole to the next, until we reward our cats for bringing home their spoils of ‘the Hunt’. Cats, in contrast, are big, mean and we often see them viciously playing with their food. The cats in Spiegleman’s work are portrayed as nasty, predatory figures with keen senses and no sense of remorse. The Pigs represent the gluttonous. Not, particularly, regarding food, but more the embodiment of selfishness– of a ‘me first’ attitude. The pig, like the mouse, is unguarded against the cat though it is not the cat’s natural prey. While text of the graphic novel is the main tool to advance the narrative, it is hard not to argue that Spiegleman’s representation provides his audience with a different perspective of the time period. Many documentaries, biographies, period pieces, and blog entries have been written about the mid 20th-century. Though, in Spiegelman’s novel, the human element (that part which caused so much suffering) and what’s left are arbitrary symbols participating in violence. As media consumers, we are exposed to brash violence every day, through every medium we can possibly imagine. But what happens when we warp these (usually) human characteristics? What happens when we leave the human violence, but represent those enacting the violence as objectively not human? Spiegelman’s narrative Maus: A Survivor’s Story allows the reader to separate human actions from the humans themselves so that he/she may critically evaluate those actions inandof themselves. When the author recreates these actions with representations of animals we begin to evaluate the characters in the novel juxtaposed to their animal counterpart. I don’t suppose I gleaned all that’s represented by Spiegelman in this short entry, nor do I believe I have amassed the sum total of knowledge in this particular graphic novel, though, I am quite satisfied by it’s addition into my literary repertoire.